Image via Houston Museum of Naturel Science. This is a fossilized in-ground Stegosaurus currently exposed at the Houston Museum of Natural Science. 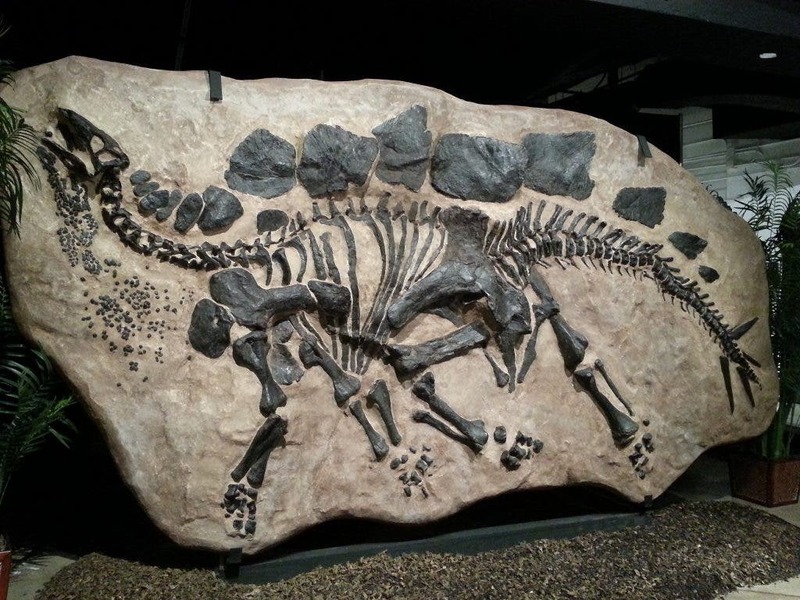 The Stegosaurus is one of the most easily recognizable species of dinosaurs, living until about 150 million years, and this remarkable fossil does a fantastic job at highlighting it. Ironically, although many people associate it with the T-Rex, the Stegosaurus is actually much more ancient. T-Rex actually lived until 65 million years ago – closer to humans than the Stegosaurus. A large, heavily built, herbivorous quadruped, Stegosaurus had a distinctive and unusual posture, with a heavily rounded back, short fore limbs, head held low to the ground, and a stiffened tail held high in the air. Its array of plates and spikes has been the subject of much speculation, and we still don’t know exactly what the purpose of the plates was. The spikes were almost certainly involved in defense, but the plates might have served a defensive purpose, but they might have also been used for thermoregulating purposes or as a mating display. The largest Stegosaurs likely weighed over 5,000 kgs (11000 pounds).